DENVER, May 12, 2017 /PRNewswire/ -- DaVita Inc. (NYSE: DVA), a leading independent medical group and a leading provider of kidney care services in the United States, joins the efforts of Mental Health America's annual May Is Mental Health Month to help raise awareness of the importance that mental health plays in individuals' overall well-being. One in five adults in the U.S. experiences a mental illness in a given year, or nearly 44 million Americans. Research shows that people with chronic medical conditions, such as chronic kidney disease, have a higher risk of depression, a common, but serious, mood disorder. If left untreated, depression may lead to a complication of chronic health conditions, reduced quality of life and increased risk of mortality. 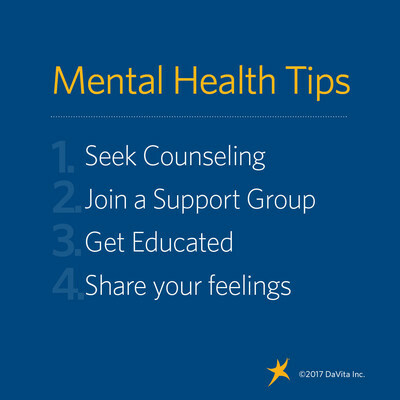 "It is important to understand the significant role that mental health plays in an individual's overall health and know when certain behaviors are potentially signs of something more," said Duane Dunn, director of social work services at DaVita. "We need to bring awareness to the benefits of intervention and how integrated services work to help those who are struggling with mental illness." DaVita social workers screen patients for depression twice a year in an effort to ensure patients are receiving the best possible quality of care and living the highest quality of life. The Everett Clinic, a DaVita Medical Group, offers several support groups and workshops designed to help patients suffering from mental illnesses. These offerings range from a Teen Skills Group, offering help to youth with mental illness, to a Living with Chronic Conditions workshop.